We've started this year with many rad things. Simalakamma got the chance to sell our stuffs in Japan. Yo yo yo! (read in gangsta style, filled with excitement) We also planned to launch several new products. To name a few, iPad case, pouch, and tote bag. Speaking about new products, we ended the 2011with The Simalakamma Parcel Projects. 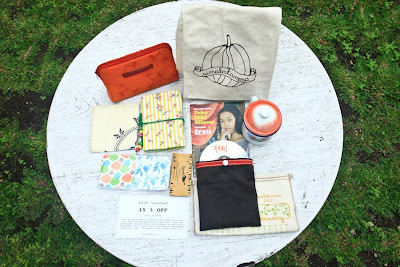 In this projects, we gathered several items that we liked and put them in one bag. In sophisticated way of speaking, we curated this lovely parcel. Inside of this package, you can find notebook by Vitarlenology, coaster by Ojantos, CD + merchandise from Frau, and other freakin nice things from us. We still got 4 packages which you can peek through our Facebook page. Feel like order one of them? Contact us through email, simalakamma@gmail.com or text, +6287838300019. So, until we meet again! Would love to see those products.